As cold weather is here we must prepare for it.Did you start searching for boots?If you wonder how to choose fabulous boots you should take into consideration your body shape and pattern of boot that will emphasize physical qualities. If you're tall, you can wear with confidence long boots and short boots, depending on the outfit you choose it. But for girls and ladies generally shorter, short boots are best. Another thing you have to consider before buying boots is where you will wear them (you'll be to work in an office, standing all day, etc) and the duration of time that you will spend outside. Knee-length boots tend to be a good choice for women who want to wear a skirt even in winter. This pair snow boots can offer more comfort than you might imagine. Stiletto boots are elegant and classic,suit well to any woman who wants to keep her femininity . 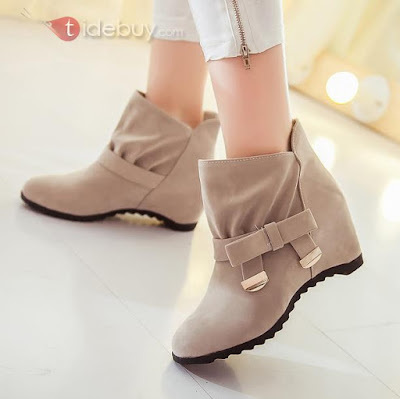 Moreover, you must know how to choose the model of boots and depending on the season. No matter if you go to the mountains or you spend your time walking find your Tidebuy boots in order to get through the cold season.They offers not only boots but trendy fashion, clothes, shoes, dresses, bags, bedding, men’s, kids, and jewelry. Most of their products have discounts as well. You want to be in trends but first of all you must be happy with what you wear.